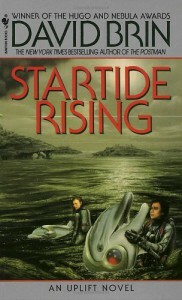 I'm finding Startide Rising to be fairly slow going, too. The story is interesting, and I care what happens, but the writing, while better than that in Sundiver, is still choppy and unprofessional. He changes viewpoint character, no kidding, every two or three pages for significant chunks of the book. That is really annoying to me. Now the plan they've worked out for hiding the ship, escaping, or signaling Earth, evading capture, or whatever, is something all the characters know but he's not telling the reader. That's also very annoying. Way to build up a false sense of suspense. If all the characters know it then the reader really should as well, to be fair. Otherwise he's just gaming us. I don't know. That really bugs me. So, he's slowly getting better as a writer, I guess. I just hope he starts improving fast enough to keep me from giving up on this series before the end. When I did finish, the ending was pretty satisfying and overall I guess I enjoyed the book. I expect his writing will continue to improve. Interesting ideas make the books worth reading despite the choppiness, for now.